ATHENS — Vasiliki Meliou did not want to retire at 53, but she had little choice, she said, after the state-owned bank she worked for was sold three years ago. 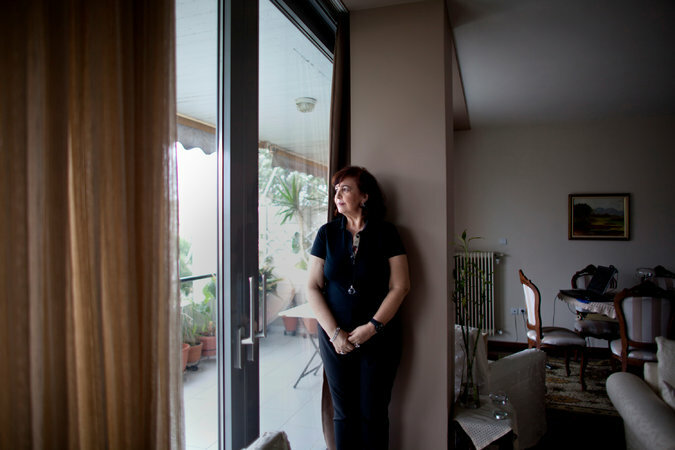 To stay at the bank carried the risk of being laid off, and with Greece’s unemployment rate above 25 percent, she doubted she would ever find another job. Greece’s big creditors — other eurozone countries, the International Monetary Fund and the European Central Bank — have done little to solve the problem. Instead, they have imposed deep cutbacks on pensions, as much as 48 percent in some cases, and further weakened the pension funds by, among other measures, pressing them to accept huge losses as part of the country’s debt write-down. Now, even as their austerity policies have driven more Greeks out of the work force and into the pension system, the creditors are seeking deeper cuts still. Ms. Meliou, who started working at the bank at 18, has already seen her pension payments cut by 35 percent. She says she sometimes cannot sleep for fear of what might happen next. As it confronts creditors over its huge debts and how best to recover from a still-crippling downturn, Greece’s left-wing government faces few problems that are more substantively and politically daunting than how to meet pension promises to retirees. In the latest round of negotiations, Greece’s creditors are demanding that Prime Minister Alexis Tsipras make further cuts in pensions as a condition of continuing to help Greece pay its enormous debts. Mr. Tsipras and his radical-left Syriza party, elected on a promise that they would reject continuing austerity demands by the creditors, are flatly refusing, saying that additional cuts would lead to a humanitarian crisis and cast another blow to a flailing economy, reducing consumer spending power at a time when it is desperately needed. In an interview published on Tuesday by the Italian newspaper Corriere della Sera, Mr. Tsipras suggested that a deal on Greece’s debt was within reach if the creditors scaled back their demands for cuts to pensions and other social services. “There just needs to be a positive attitude on alternative proposals to cuts to pensions or the imposition of recessionary measures,” he said. The problem is that much more difficult because Greece, like most European nations, has an aging population, meaning it has relatively fewer young workers to help pay the bills for the growing numbers of retirees. The imbalance is made even worse by the chronic unemployment among young people since the financial crisis started in 2008. Greece’s social security system was troubled even before the crisis, already divided into more than 130 funds and offering a crazy quilt of early-retirement options that were a monument to past political patronage. In 2012, the pension funds, which were obliged under Greek law to own government bonds, were hit by a huge debt write-down as those bonds plummeted in value. As a result they lost about 10 billion euros, or $11.1 billion — roughly 60 percent of their reserves. Greece’s creditors, seeking to make the Greek labor market more competitive, insisted that the government reduce the amount companies and workers must contribute toward pensions. And they insisted that Greece reduce its minimum wage so that those who do contribute have smaller outlays. At the same time, the pension system was becoming an even bigger component of the social safety net, absorbing thousands. People like Ms. Meliou retired early, either because of the sale of state-owned companies, because they feared their salaries would be cut and thus their pensions would be smaller, or simply because their businesses failed. Few are living comfortably, and many support unemployed children. 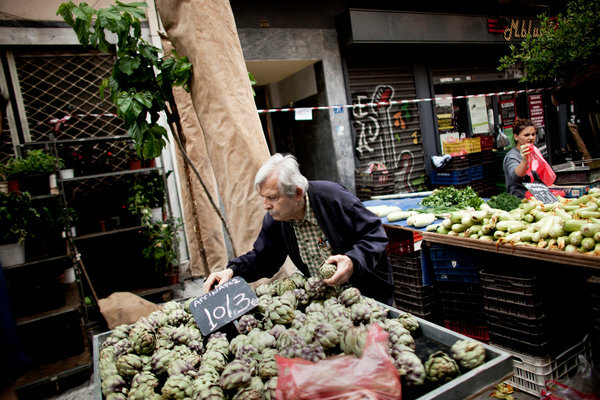 Recent government figures indicate that nearly 45 percent of Greek retirees live at or below the poverty line. About 60 percent get pensions of €700 a month or less. Still, pensions eat up a big portion of the government’s budget, equivalent to about 16 percent of the country’s shrunken gross domestic product, up from 13 percent in 2009, making it proportionally the most expensive pension system in Europe. Panagiota Stathopoulou, 55, who retired recently after working 30 years in an unemployment office, said that her pension was supposed to have paid out €900 a month, but that it had been cut to €700. Still, she said, when she looks around her, she feels guilty about having even that much. At the grocery store recently, she was approached by an old man who asked if she would buy him some food. Like many other retirees, she scrimps so that she can also help one of her children financially. Her daughter’s husband has a job, but he often is not paid. Greece’s creditors pushed the country to overhaul its pension system early on, pressing it to merge the funds and to limit early-retirement benefits that could seem overly generous to outsiders, such as exemptions that let hairdressers retire at 50. But this enormous bureaucratic undertaking has created its own problems, particularly at a time when the number of government employees was shrinking. Reliable data on the state of the Greek pension system does not seem to exist. 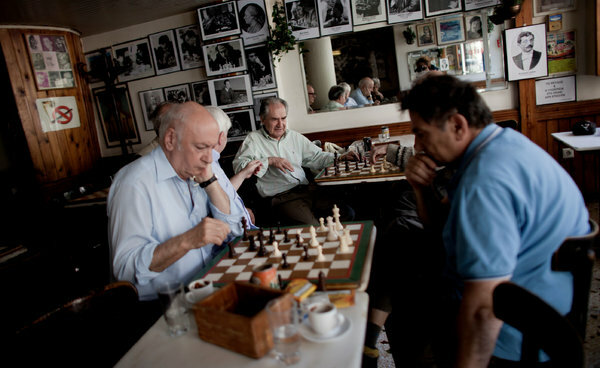 Platon Tinios, an economist and pension expert at Piraeus University, points out that despite a wave of early retirements, the latest official data suggests that there are 2.65 million retirees today, fewer than the 2.7 million in 2013. One explanation may be that there is a backlog of more than 400,000 pension applications, some of which have been in the pipeline for three years, government officials have said. However bad the problems are now, Mr. Tinios said, the situation is likely to get worse. The limits on early retirement in 2010 did not include people who were already vested, he said, meaning that the flow into the system will remain high for years to come. Women who took early retirement, most of whom had lower-paying jobs, will find themselves with small or shrinking incomes for the rest of their lives, he added. “The system is a ticking time bomb,” he said. After months of negotiations between the Tsipras government and Greece’s creditors, in which pensions appeared to be a central sticking point, the two sides unveiled dueling proposals last week on a range of issues that could hardly have been further apart. The creditors want to establish substantial early-retirement penalties for those who still choose the option, and to cut existing pensions even more — even the smallest ones. The proposal also demands further unifying the funds and establishing a closer link between contribution and benefits, most likely setting the stage for yet more cuts. December 2009 Credit ratings agencies downgrade Greece on fears that it could default on its debt. May 2010 Europe and Greece reach a $146 billion rescue package, conditional on austerity measures. Some economists say the required cuts could kill the patient. October 2011 Banks agree to take a 50 percent loss on the face value of their Greek debt. July 2012 Stocks soar after the head of the E.C.B. says policy makers will do ”whatever it takes” to save the euro zone. January 2015 Greek voters choose an anti-austerity party. Alexis Tsipras becomes prime minister. May 2015 Greece quells fears of an imminent default on its debts, authorizing a big loan payment to the I.M.F. It is not clear how much longer Greece can continue to scrape by. 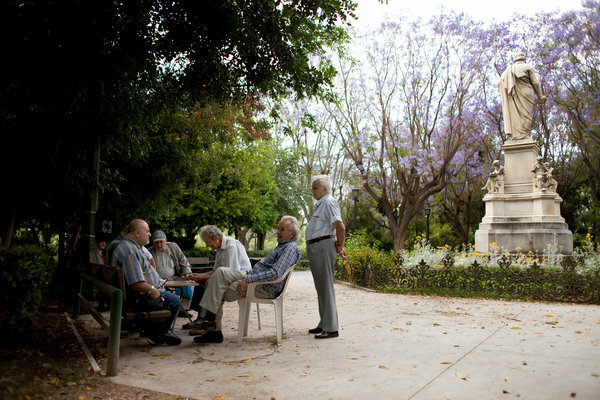 Other moves could also hit retirees hard. The creditors are calling, for instance, for a sharp rise in taxes on basic consumer goods such as medicine to 11 percent from 6.5 percent, a step that would be felt especially hard by people on fixed incomes. The tax on electricity would go to 23 percent from 13 percent. In his own 47-page proposal, Mr. Tsipras offered to slowly eliminate the remaining early-retirement programs. Some analysts say that the situation Greece’s pension system faces today was predictable. Jens Bastian, an economist and former member of a team of European Union specialists that helped supervise the country’s bailout, said it was sad to see how little creative thinking was going on. Mr. Bastian pointed out that there might be more trouble ahead as retirees turn to the courts. “It’s already happened in a couple of cases,” he said. Inside a government office in Athens recently, dozens of people waited, some hoping only for an update on when their pensions might come through. Lazaros Papadopoulos, 70, said that he had closed his store and filed the required paperwork three years ago, and that he had been trying to live on a “pre-pension” benefit of €420 a month. Rania Zygogianni, 51, who is divorced, was also there, holding a thick green file. She was hoping to qualify for a reduced early pension of roughly €500 a month as an older mother with young children, a category that has been eliminated for new workers. Ms. Zygogianni, who trained as an economist, used to work in the Agriculture Ministry, and she said that she would prefer to work. But she has been looking for a job without success, and she has had to accept money from her mother and her sister. A version of this article appears in print on June 10, 2015, on page A1 of the New York edition with the headline: Pensioners Are Squeezed as Greece’s Creditors Push for More Cuts . Posted on June 10, 2015, in Postings. Bookmark the permalink. Leave a comment.